The Braveheart Triathlon is exactly that. With an open water swim of over a mile, more than 50 miles on the bike and a run up and down Ben Nevis, this is not an event for the fainthearted. The Braveheart Triathlon is exactly that. With an open water swim of over a mile, more than 50 miles on the bike and a run up and down Ben Nevis, this is not an event for the fainthearted. In this year's race, Dougie Vipond joins over 100 competitors for a day he'll remember for ever. 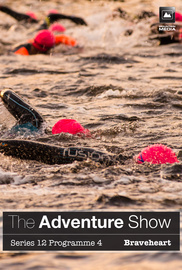 Also in this month's Adventure Show, we're joining a remarkable man who's determined that losing two limbs won't prevent him from doing the sports he loves. And we're off to Patagonia with one of Scotland's most ambitious adventurers as he undertakes a month-long trip in one of the world's most remote landscapes.